A survey of Belgium’s four leading ports indicates that business during the first two quarters was either stagnant or actually in decline, with forecasts suggesting little in the way of change for the year overall compared to 2013. Belgium’s leading port of Antwerp handles a wide variety of dry bulk commodities and has more than ten dedicated terminals given over to this type of traffic. Even so, in the first six months of 2014, it reported a total of 6,870,625 tonnes of dry bulk, which was a decrease of 5% compared to the first half of 2013. “Once again, the decline is mainly due to the amount of coal handled,” says press spokesperson Annik Dirkx. She notes that, during the last six months, coal volumes fell by 30.5% to 839,642 tonnes. Part of the reason for this is that the port does not have a coal power plant. A recent initiative to build such an installation was rejected, due to ecological and political reasons. Since the presence of coal traffic often attracts more coal traffic, the lack of the power plant is seen as a disincentive for other importers. In addition, Antwerp has had a price setting issue with some railway operators in Belgium. Competitors in the Netherlands, however, were able to offer better prices for the transport of coal by rail, so this caused Antwerp to lose some contracts. Subsequently, although the price setting issue has been resolved, short-term recovery of contracts has not yet taken place. business development manager Wim Dillen says that there is more than sufficient capacity to handle existing dry bulk traffic. In addition, potential exists to grow facilities to cope with any anticipated increase in commodities. As for the type of vessel accessing the port, he notes that, thanks to the large and wide locks on the Scheldt River, even Capesize vessels can be docked, since there is a maximum draught of 15.56 metres. However, the Port of Antwerp is located alongside a tidal river, so the maximum draught at any given time depends on the tides, too. “After realization of the new lock on the left bank, it will have draught up to 17.4 metres,” says Dillen, adding that major bulks, such as coal and iron ore, are invariably carried in Capesize vessels, while minor bulks, such as industrial minerals, grain, scrap, concentrates and so on, tend to be loaded in smaller Panamax vessels. On the land side, most dry bulk consignments are moved by inland waterway, although rail also plays an important role.Wherever possible, the preference is not to move commodities by road. “The Port of Antwerp actively promotes modal shift in favour of barge and rail,” says Dillen. He points out that Antwerp is famous for its high productivity which results in shorter handling times and therefore lower handling costs. Additionally, storage costs are very favourable compared to other neighbouring ports. Overall, port dues are competitive, even though ‘river costs’ — pilotage and the use of tugboats — are an extra cost for a river port like Antwerp compared to coastal ports, such as Rotterdam in the neighbouring Netherlands. “Luckily, thanks to the advantages mentioned earlier, together with more favourable hinterland costs and the cargo generating factor of being so close to the large industrial and commercial centres of Europe, these allow us to be very competitive indeed,” says Dillen. Significantly, half of the 1.3mt (million tonnes) of sugar exported annually from Europe is handled by Antwerp. CEO Thomas Hubbuch of the sugar company Tiense Suiker notes that the port serves practically all destinations in the world and has the best terminal operators for storing and transshipping sugar. Jan Bruyneel, terminal manager of the Manufert division of Euroports Terminals Antwerp explains that Antwerp is centrally located within the European sugar belt. “The loamy ground and the climate with just the right amounts of rain and sun make this region ideal for sugarbeet,” he says, noting that this is the main reason why Antwerp has become the main European port of export for sugarbeet. Indeed, the Manufert terminal remains one of the largest sugar handlers in Antwerp, with a storage capacity of 260,000 tonnes of refined bulk sugar. Bruyneel believes that it is the flexibility of the port that naturally attracts sugarbeet traffic, because this allows sugar operators to react very quickly and to get shipments to their destination efficiently. “Not only are there good transport connections by rail, road and barge between the port and the European hinterland, but also the port of Antwerp has the highly trained personnel with the necessary technical qualifications to create clear added value,” he says. In the first half of this year, Belgium’s second largest port, that of Ghent, whose traffic mainly consists of various dry bulk commodities, handled a combined 24mt of traffic, broadly similar to the figure posted last year. Deep sea and coastal volumes increased by 5.8%, although inland waterway traffic was down 6.4%. However, during the vibrant second quarter, almost 12.4mt was handled, being the best result for almost two years, with 720,000 tonnes more reported than for the first quarter of the year. Indeed, for April–June 2014, there was a total of 6.8mt of sea cargo (up 6.3% increase), while inland waterway traffic amounted to almost 5.5mt, down 7.7%. According to Daan Schalck, CEO Port of Ghent, there was an increase in seaborne agricultural products, solid mineral fuels, ores and metal residues, and chemicals. However, metallurgical products, among others, were down. As for inland navigation, raw minerals and building materials rose notably, which was offset by a drop in the amount of agricultural products and solid mineral fuels moving inland by barge. “Overall, the amount of dry bulk handled by deep sea and coastal vessels increased,” said Schalck. Significantly, in July, Belgian Eco Energy (BEE) announced that it was to build a new biomass power station — Bee Power Gent — on the Ghent Coal Terminal site on the Ghent–Terneuzen Canal. As part of the deal, BEE has entered into a long-term agreement with both the SEA-invest stevedoring company and with Ghent Port Company. SEA-invest will acquire the necessary cranes, conveyor belts and storage silos. “The vicinity of the water is necessary because the biomass (short-rotation wood chips and agro-waste flows) will be supplied on board seagoing vessels, both via transatlantic and European transport. The biomass used will be 100% sustainable and checked every two years by external parties,” noted Schalck, adding that residual heat produced by the plant will be used by companies in the port and also in neighbouring residential areas. The plant, which is slated to open in the third quarter of 2017, will also meet the strictest emission standards as to dust, nitrogen and sulphur. As for other investment, of the €12 million profit posted in 2013, €5 million has been allocated to the project to build a new sealock in Terneuzen, while the remaining €7 million has been set aside for further infrastructure development. Flanders and the Netherlands have jointly decided to build the new, larger sea lock in Terneuzen by 2021. Last year, an engineering firm was contracted to draw up the plans for this lock, with a Draft Route Resolution to be published by early 2015. Another important investment is being made in a single, cross-border, integrated port information system. As of next year, ships calling at Ghent or at the Dutch ports of Vlissingen and Terneuzen, which are administered by Zeeland Seaports, will be able to transmit all their data electronically via one and the same system. “This will be more efficient and less expensive than the two individual systems that are currently in use, and it will also be a major step towards coordinating the flow of shipping traffic through the planned sea lock in Terneuzen,” notes Schalck. Ghent port operators also continue to invest in installations. In May this year, Belgium’s oldest stevedoring company, Stukwerkers Havenbedrijf, opened a new, €6 million warehouse. The facility, which has been built on Grootdok quay on the site of a former, smaller warehouse, is aimed mainly at accommodating rising fertilizer traffic. It covers an area of 8,000 square metres and can hold up to 60,000 tonnes of dry bulk at any one time. Stukwerkers subsequently announced it had signed a contract with an existing customer, OCI Nitrogen, for the storage and transshipment of artificial fertilizer thanks to having the new facility. Consignments arrive at Ghent by barge from the Netherlands, from where they are exported to mainland Europe, the UK and further afield by either barge or ocean-going vessel. The aim is to handle 300,000 tonnes annually, although this could be further enhanced when shipments are moved from barge to sea transport. Ghent is unusual in that half of all cargo that it handles is transported on board inland waterway vessels. A study, carried out in 2012, found that inland waterways carried 50% of all cargo, while road accounted for 42% and rail 8%. The original target was for inland waterways to handle half of all traffic by 2020, with road dropping to 35% and rail rising to 15%. Schalck observes that road haulage is slowly decreasing, while inland navigation is on the rise. Rail, however, remains a concern, with traffic down by more than 2% and predicted to diminish even further. For the past few years, the combined total of liquid bulk, dry bulk and break bulk traffic at the Belgian coastal Port of Oostende (Ostend) has remained steady at around 1.5mt. This type of cargo is mainly handled in the lock-protected inner harbour, but also at the deep water quay, which is located in the tidal outer harbour. In first six months of 2014, Oostende handled 770,000 tonnes, representing growth of 2.4%, prompting port authority spokesperson Jan Allaert to forecast end-of-year traffic similar to last year’s figure. In terms of investments, the various port operators have financed construction of additional storage facilities in recent times, but otherwise have sufficient capacity to accommodate future growth. “Oostende is essentially a short sea port, which means that we almost only handle cargo coming from or going to Europe. Most of the general cargo, which includes dry bulk, is transported via coasters to our port. Therefore, the biggest cargo vessels we receive tend to be sand dredgers,” says Allaert. Land side, most consignments are moved by road or inland waterways. Although there is a rail link, operators are only interested in rostering block trains, since otherwise they would not be profitable to operate. “At present, the quantities we generate are not big enough to justify complete trains,” says Allaert, who also notes that some cargo arriving at Oostende is also used immediately in production facilities or factories actually located in the port. He points out that, while overall volumes handled at Oostende do not vary from one year to another, the various commodities have diversified greatly. Three companies (NHM, Sagrex and Deme Building Materials) are now active in the sand and gravel market, with all three unusually having terminals in the tidal area of the port. This gives them a major advantage over other Belgium ports in terms of vessel turnaround times. Import consignments of ferro-silicium ore, inbound from Scandinavia, mainly Norway, also pass through the port. The product, which is mostly used by the construction industry, is calibrated, broken and finally stuffed in containers within the port before being exported to end customers worldwide. Two years ago, Oostende opened a dedicated salt depot, which holds consignments imported via inland barges and coasters. However, volumes are influenced greatly by the severity of winter weather and can therefore vary significantly from one year to the next. Imported timber is another feature of the port’s dry bulk traffic. Logs are regularly imported, with the majority sourced in the Baltic States. These go to factories located within a radius of 300km from the port.Allaert says that the port authority is trying to increase this kind of traffic, but the forestry products sector is known to be highly volatile. Like several other European ports, Oostende has also moved into the wood pellets sector, receiving its first import consignment at the start of the year. The mild winter meant that traffic was relatively weak, but those companies involved want to develop the port as a hub, with more shipments due to arrive at the end of the year. Sepeolite, one of the major ingredients in cat litter, was first imported some 15 years ago and Oostende is still used as a main distribution hub. Significant added value — calibrating and stuffing — takes place in the port, with the final products exported to Benelux supermarkets. At present, the largest dry bulk carriers seen at Zeebrugge specialize in forestry products, drawing up to 13 metres of water. “Obviously, we see a variety of different vessel sizes. Sand and gravel, for example, are carried by much smaller vessels, which require a draught ranging from five to seven metres,” says Swyngedouw. Most dry bulk nowadays leaves the port by truck, some as transshipment; some consignments also go by rail or via inland waterways, although the quantities involved are not as great. “It is all a matter of logistics cost and reception possibilities at the other end as to whether rail or barge are used. Sometimes, rail heads are not close enough to the end customer, while other cannot always receive barges,” he says. Dry bulk commodities handled are mostly sand, gravel, forestry products, fodder and grain. However, Zeebrugge is not limited to these, since Swyngedouw points out that, nowadays, handling and storage technology is such that the port can guarantee a clean operation, with safeguards concerning this written into the port authority’s clean port policy. Being a coastal port, port fees charged by Zeebrugge are simple and easy to calculate, he adds. As a result, the cost of accessing port service are both moderate and competitive compared to regional rivals. Moreover, as a mid-size port with available capacity, Zeebrugge can also accommodate customers wanting to set up a strategic hub operation. Amsterdam aims to develop its role as a multipurpose hub for Northern Europe by making more use of idle container berths. The Port of Amsterdam is looking to diversify its cargo portfolio by attracting project and breakbulk traffic to Amsterdam Container Terminal (ACT). Port of Amsterdam helped fund the building of a state-of-the- art container terminal in the late 1990s on a 54 hectare site. It was launched in 2000 and featured an ‘indented’ berth to enable cranes to work on ships from both sides. The idea was to offer shipping lines a real alternative to Rotterdam’s array of container terminals. But, despite a series of ownership changes, the facility never really gained a foothold in the box market and ceased operations in 2012. So far it has been confirmed that MEO, a stevedoring company already active in Velsen near Ijmuiden, will transfer its activities to the ACT terminal in Amsterdam. It will focus on containers, project cargo, offshore wind, breakbulk and conventional cargo including steel, wood and pipes. Talks are ongoing with a second un-named party, but a range of potential operators have expressed an interest in using ACT. “There are lots of large offshore wind projects at various stages of development in Holland, the UK and other countries and the new operators will try and get into these markets,” said Gorris. The re-opening of the terminal will further boost already thriving traffic at the port. In the first six months of 2014, port of Amsterdam volume rose by 5.4% to 51mt (million tonnes). Energy-related cargoes, particularly coal, proved to be the prime generator of throughput growth. Coal volumes were up significantly compared to a year earlier to reach 10.3mt in the first half of the year. However, after such an explosive start to 2014, slower growth in coal handling is expected in the second half of 2014. Indeed, even with the slight slowdown in growth forecast in the second half, coal volumes are still expected to rise above the record 18.5mt handled in 2013. “We’re already a long way ahead of last year so even when it slows we’re still anticipating a small increase,” said Gorris. EU sanctions imposed against Russia as punishment for its actions in Ukraine have not translated into any concrete changes in coal sourcing, with Colombia still the main supplier but Russia and the US also providing options for importers. However, US supplies received by Amsterdam have fallen away this year due to higher domestic coal prices in the US and bearish global prices. “Coal prices are low so this is encouraging the use of coal instead of gas in Europe, but low prices are not helping US exporters,” explained Gorris. He said tighter European regulations on household waste disposal regulations had also proven a positive for the port. “The regulations are stricter on how waste can be dumped,” he said. “So now we’re seeing an influx of waste, mainly from the UK, to Holland, Scandinavia and Germany — countries which have spare capacity to incinerate waste, unlike the UK which has large taxes on waste that is dumped in landfills. Amsterdam is also gaining from investments made by its leading stevedores. The deal which saw OBA acquire Rietlanden’s 9-hectare enclave has now been pushed through and will boost the operating efficiency and capacity of the former’s facility. The stevedore has also now installed a new 60-tonne gantry crane which replaces a 30-tonne gantry crane built in 1954. The new crane and associated conveyor belt system cost €15 million and means that OBA, Europe’s second-largest coal terminal and storage facility after Rotterdam’s EMO, now has at its disposal the three largest bulk handling cranes in Amsterdam. “The new gantry crane, which is capable of lifting 60t at once, is among the largest and fastest cranes in the world for loading and unloading dry bulk cargoes,” said HES Beheer, the majority stakeholder in OBA. “It has a peak capacity of 3,500 tonnes per hour when handling coal. This represents a substantial increase in unloading capacity and efficiency, Biomass is also expected to be a major boon for the Port of Amsterdam in the coming years. Gorris said that volumes of biomass had been stable for much of the last five years, but new plans to reduce emissions in the Netherlands will see volumes increase. And a final decision on the construction of a new sea lock near Ijmuiden which managers hope will give the port and its users a major boost will now be taken in November. Gorris said the locks would be crucial to ensuring Amsterdam sustains its growth and position as Western Europe’s fourth largest port. EMO is able to accommodate the world’s largest dry bulk vessels, and yet it never ceases to look to the future and plan ahead — now more than ever. The terminal has significantly increased its storage and transshipment capacity and efficiency. This will ensure that EMO is fully equipped to enhance its safety, efficiency and sustainability performance, and to continue to serve its customers as a reliable partner in dry bulk transshipment in the coming decades. EMO is a reliable partner. The company stays on top of the latest developments in the market. EMO continually analyses its customers’ needs, the quality of its services and the terminal’s performance. In anticipation of market trends and customer needs, it is continuously geared towards offering a more efficient, cleaner and safer terminal, one designed to meet all expectations. The French river port of Rouen is Europe’s largest grain exporter, welcoming 3,000 deep sea vessels annually and double that number of river barges. For the half year to the end of June, it handled 5.8mt (million tonnes) of dry bulk, compared to 5.41mt in the first six months of 2013, which is an increase of 7%. According to port spokesperson François Henriot, three main areas are responsible for the upswing in traffic: cereals, which increased from 3.9mt to 4mt; aggregates, which grew from 302,000 tonnes to 454,000 tonnes; and fertilizers, climbing from 188,000 tonnes to 307,000 tonnes. Coal, however, was down from 214,000 tonnes in 2013 to just 131,500 tonnes. He notes that aggregates had benefited from new highway construction in the region, with a part of an expected total traffic of 800,000 tonnes dedicated to this particular project. Furthermore, the port recently re-opened a marine aggregates unloading station. The decrease in coal he attributes to the mild winter in the Île-de-France region. In terms of investment, Rouen is nowadays reaping the benefit of having very good quality grain terminals, which are used by five operators; these are capable of housing 1.3mt of agribulk products. Capacity, notes Henriot, is now more than sufficient to handle future growth in dry bulk traffic. The main upgrade to the Port of Rouen involves improving its maritime access. In total, €175 million is being spent to deepen the draught by one metre to 11.7 metres along the entire 120km access channel from the sea, with full implementation slated for the beginning of 2018. For the current year, the second phase, which includes the extension of the Hautot-sur-Seine turning circle, is being undertaken. Once fully functional, the port will be able to load consignments of up to 54,000 tonnes of cereals, compared to 45,000 tonnes at present. Currently, Rouen does receive visits from Capesize vessels, although these cannot sail fully laden given draught restrictions. In December 2009, for example, the 290-metre long Royal Accord docked, conveying 77,784 tonnes of imported coal, while in July 2013, the Ocean Clarion offloaded a 77,000-tonne consignment of coal. As for land side transport of dry bulk, around 70% of cereals movements are undertaken by road in the main hinterland, comprising the regions of Beauce, Picardie and Normandie. Rail has a market share of 9–10%, while inland waterways account for 20–21% of this traffic, the large percentage being down to the fact that all operators have recently renewed their river discharge equipment to help boost market share. Quizzed as to whether Rouen’s charges make it an attractive port to do business with, Henriot concedes that additional pilotage charges for vessels coming up the Seine do have to be taken into account. Having said that, these also cover river access as far as the western boundary of the Paris Basin, France’s most important in terms of the number and wealth of its consumers. In contrast to Rouen, for the first five months of 2014, the French Port of Bordeaux handled 1,283,616 tonnes of dry bulk traffic compared with 1,742,933 tonnes in the comparable 2013 period. This represented an overall drop of 26.4%. Of total dry bulk traffic, 59.4% was imported and 40.6% exported. According to port development officer Sylvie Saint-Vignes, there were several factors influencing the decline in traffic, with the quality of the grain harvest and the world market price depressing demand. Scrap metal exports to Spain were also hit by the poor state of the economy in that country, prompting logistics companies to switch consignments elsewhere, while coal volumes have also been undermined by economic factors. “Our forecasts suggest we will have handled in the region of 8.5–8.7mt of dry bulk by the end of the year,” says Saint-Vignes. She anticipates increases in construction materials, aggregates, recycled crushed glass and wood chip, with decreases in tropical timber, wood pulp, grains and coal. In terms of port layout, Bassens Harbour is a multi-purpose hub; Blaye concentrates on grain and liquid bulk, with some heavy-lift cargo; and Le Verdon can accept industrial bulks. These will be joined by the new mid-river development at Grattequina in 2015. Today, a total of four dedicated terminals handle dry bulk, consisting of aggregates, clinker, industrial sand, quartz, coke, fertilizer and constituent raw materials, and cereals. The Port of Bordeaux is a major export hub in south-west France for cereals. In terms of dry bulk investment, Bordeaux has two important projects scheduled for 2015. At Le Verdon, a new private operator, Europorte, is due to start operations.While ostensibly a container handling area, Le Verdon’s deep water berth will also provide additional capacity for handling industrial dry bulk. In addition, a new terminal, Grattequina, is due to open on the left bank of river Garonne. A total of €14 million has been invested by the port authority and its partners, with the terminal specializing in out-of-gauge components for the wind energy sector and in the supply of aggregates for the Aquitaine region. Capacity for dry bulk at Bordeaux will therefore increase to around 4.2mt annually, spread out over seven dedicated terminals, of which three handle industrial bulk. Services are provided by two private stevedoring companies, with storage mostly provided at the Bassens multimodal terminal or at Le Verdon, where more than 200 hectares are available. At Bassens, a maximum draught of 10.5 metres allows bulk carriers of up to 45,000 tonnes to be accommodated, while in Le Verdon this increases to 12.5 metres, sufficient for 60,000-tonne vessels to call. Saint-Vignes also points out that the port’s access channel has also been recently upgraded to improve navigation safety. The largest ever bulk carrier to call at Bordeaux was the post-Panamax Yeoman Bridge, which loaded up to half of its nominal 96,000-tonne capacity in order to comply with the maximum draught at Bassens, where it discharged 55,000 tonnes of aggregates. However, depending on the commodity being handled, vessel sizes can vary considerably. Cereals, for example, are shipped out on 5,000–25,000dwt vessels, while aggregates require bigger ships of up to 30,000dwt. In contrast, wood pulp and chips make use of smaller, 3,000dwt bulk carriers. Landside movement of dry bulk involves inland waterways, as well as more traditional road and rail. Saint-Vignes points out that all the port rail infrastructure is being renewed on a step-by-step basis. Quizzed as to whether Bordeaux is regionally competitive in terms of fees and costs, Saint-Vignes points out that, given a record year in 2013, when more than 9mt was handled, it appears that the port’s clients are satisfied with its tariffs and services. 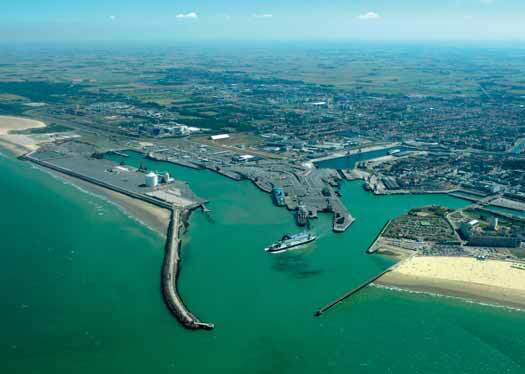 The French Port of Calais, which mainly handles short sea and ferry services to and from the UK, handled 192,000 tonnes of dry bulk during the first half of 2014, which is a 1% increase over the comparable 2013 period. Main dry bulk commodities handled at the port are pet coke, titanium ore, aggregates, stones and sand. Port Development Head of Studies, Frank-Edouard Tiberghien, notes that titanium ore volumes have doubled to 56,000 tonnes, thanks to the completion of revamping work at the nearby Tioxide plant. Aggregates, in contrast, have decreased in volume, reflecting the crisis in France’s construction industry. “We don’t generate end-of-end forecasts as such, but we believe that volumes handled in 2014 should be broadly similar to those of last year,” says Tiberghien. In terms of investment, as part of the construction of the Railmotorway Terminal along the Deepwater Quay, some dry bulk activities there might be re-developed, with operations switched to Bassin Carnot, which is a lock-protected basin. Future investment might also be made in a further hopper. “As for capacity, we now have sufficient to handle any predictable growth in this sector,” he says. The Port of Calais presently offers a maximum draught of 12.5 metres at its Deepwater Quay, which has handled vessels of up to 200 metres in length in the shape of Federal Hudson Class. “There is no inland waterway connection at Calais, so all consignments leaving or entering the port do so by road,” says Tiberghien. Asked about Calais’ pricing policy as a means of attracting traffic, he notes that the port’s duties are competitive and in line with what other ports in the region charge.